Last night, the 3 of us ventured to a friends house for a NYE party. We went early and only stayed for a little over an hour but it was nice to get out and see a bunch of our friends. We've been trying to get out as much as possible to keep sane. Logan has been to several restaurants already and if I time it right he usually just sleeps like an angel. The other night we waited too long to get out and then our first eating place was too crowded so he was hungry and screaming before I got my plate. That led to me having to breastfeed him in the car and eat my dinner at home from a carry out package. This week we're going to try a bottle and see how that goes which will really free me up at night (and take care of any situation like that). At this point, he is very portable. It's not like we have to entertain him, he's just strapped into his carseat. The other night a friend of ours came over to watch him for a couple of hours so Marty and I could go out to dinner and watch the FSU/ND game - that was awesome! He's gaining weight which is great even though I'm still having a lot of breastfeeding issues. Turns out he had a slight tongue tie (look it up if interested) and he had to get his frenulum clipped. We just did that on Friday so hopefully soon we can work it out where feeding him isn't so painful. He left the hospital at 7lbs 5oz (babies lose weight from birth) and on Friday he was 8lbs 5oz which the doctor was happy with. Since I have nothing to compare him to, I don't know if he is a good/easy baby or not. Despite what Marty may have you believe, he doesn't cry from 7pm to 1am every night. There is just typically a chunk of time during that period where he is fussy - we can soothe him for a bit then he cries again. A lot of people have told us this is pretty typical for babies in the evening. He does sleep a lot - pretty much it's a feed, maybe a bit of wakefulness, then sleep for 3-4 hours. Sometimes even longer (but not at night yet, dangit). He loves to get bounced on the ball. Here we are ringing in the New Year. Actually, we weren't. This was around 10pm right before I went to bed. That's my dad's letter sweater from high school that I'm sporting. Hot, I know. 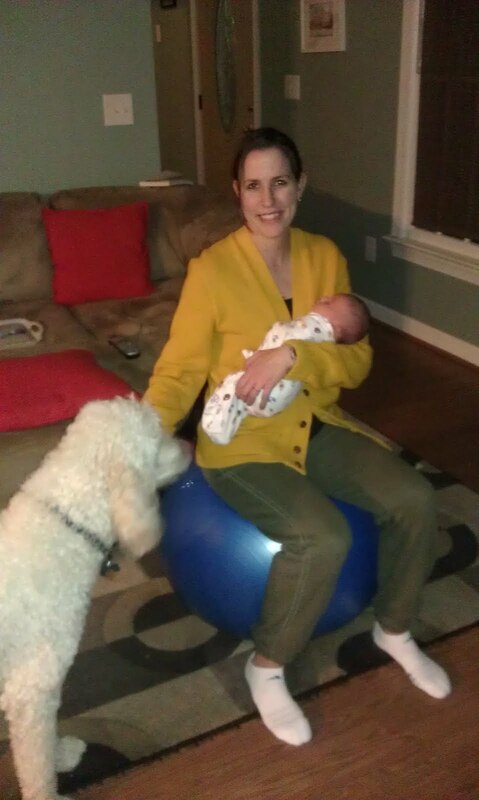 Also, this picture is huge because Tassie has been totally scared of the yoga ball forever. She's realized that in order to get close to us right now she has to get over her fear, and she's done a pretty good job so far. I am really itching to start running again. I may do a bit of a walk/jog today and see how it goes. The weather is way too mild to pass this up. Well this year starts off quite a bit different than last year for you, that is for sure.